Children all over the world love singing Primary songs﻿—just like you! This month, let’s meet Emeline and William Rose of Whitehouse, Texas. It’s family home evening in the Rose household, and Emeline (9) and William (6) listen intently as their dad plays two notes on the piano. What song does it sound like? “I Hope They Call Me on a Mission”? No. The children listen again as Dad adds one more note to the tune. “‘I Love to See the Temple’!” Emeline exclaims. That’s it! Emeline and William and their older brother, Michael (15), listen to the piano and guess a few more Primary songs during one of their favorite family home evening activities. Music is important to the whole family, and it blends into their lives every day. One thing that Emeline and William look forward to every night is singing a hymn or Primary song with their parents privately before going to bed. It’s a special family tradition. Something else that makes the children feel good is being together with their family. “We all like to be around each other,” Emeline says. The family enjoys reading together, going to the library, playing games, watching old movies, and dancing around the room while Dad plays the piano. William and Emeline like going to the zoo and swimming in the warm water of Lake Tyler near their home. In addition to having fun together, the Roses learn about the gospel together. They have family prayer in the morning and at night, and many mornings they talk about one of My Gospel Standards during breakfast. The children try to follow Jesus Christ’s teachings. “I follow Jesus’s example by saying my prayers morning and night,” William says. He is also learning to read the scriptures, and likes the story about Nephi’s bravery in obtaining the brass plates. She likes letting people know what church she goes to. One day at school, some children were talking about what churches they attended. Emeline wasn’t shy about sharing the full name of the Church, which the other children hadn’t heard of before. Since they moved, Emeline and William have seen that while there are new friends to meet and places to see, they still enjoy the same Primary classes and lessons they had before. They still have a bishop, teachers, and a music director, just like in their old ward. And, of course, they still have the singing. They both love Dad’s milk shakes! 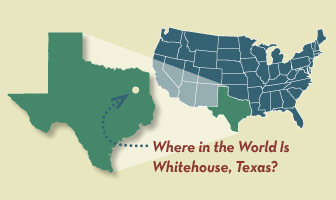 Where in the World Is Whitehouse, Texas?